Nice Location ... 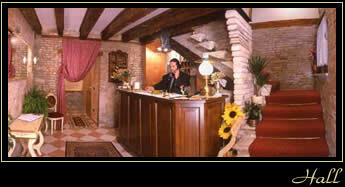 The hotel was in a nice location in Venice, very clean and safe. It is recommended that you know how to speak Italian at this place though since the staff doesn't speak much English. The Al Gallo you find today is a newly renovated family hotel, the decor in typically Venetian style; perfect for a quiet and long-planned vacation in Venice, equipped with all the comforts. The rooms are spacious and each has bathroom, colour tv, hair dryer, telephone, safe, air conditioning, and minibar. We are conveniently located near the bus terminals and the railway station. Venice Marco Polo airport is about 20 min. away. 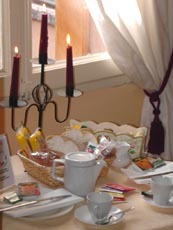 All the rooms with: TV color, frigobar, hair dreier and Air Conditioned. The Hotel "Al Gallo" is in the historical centre of Venice but very easy to reach from Venice S. Lucia railway station as well as Marco Polo airport. This is a prime location for an hotel in Venice because both Piazzale Roma and St. Mark's Square can be reached in 10 minutes walking distance. The " ATVO blue bus" or the ACTV bus n° 5. Go towards Giardini Papadoli, then enter the wide gate of Giardini Papadopoli and continue all straight on will find another little bridge and Sofitel Hotel on your left hand-side. Cross the bridge, turn right and you will see on yor left a square with a Church (Tolentini's Church): continue always straight on following the canal on your right. Rememeber that now you don't need to cross any bridge till Hotel Al Gallo. You will see a pharmacy on your left (on your right there is a canal), and on the corner a little Glass shop. Turn left and proceed all straight on (always having the canal on your right). You will see on right a restaurant called "Ribot", then a cameras and movies shop, a Tobacconist, Hotel Al Sole, Hotel Falier and at the end of this street called Fondamenta Minotto you will find on your left Calle del Forno. The full address is: Hotel Al Gallo Santa Croce 88 Salizada San Pantalon Calle del Forno. Cross the big bridge on Canal Grande "Scalzi" bridge, turn on you right and follow the Canal till you find another bridge, cross it anf then turn left. Now you have a Canal on your right side and Gardena Hotel on the left side. Follow the strret for about 100 meters, you will find the Sofitel Hotel and then you will find a pharmacy, and on the corner a little Glass shop. Turn left and then continue all straight on with the canal on your right. You will see on right a restaurant called "Ribot", then a cameras and movies shop, a Tobacconist, Hotel Al Sole, Hotel Falier and at the end of this street called Fondamenta Minotto you will find on your left Calle del Forno. If your baggage is too heavy you can reach the hotel by waterbus number 1, 82, 52 or N up to Piazzale Roma. You will be able to take a taxi that will carry you to 30 meters from the hotel.